This is a great post-exercise snack! Today I walked 2.5 miles, and also I spent about 6 hours programming, so I was especially hungry in the late afternoon. I enjoyed an Almond & Coconut Kind bar. Not only was it delicious, but it seemed to give me more energy, which makes the evening time much more enjoyable. I often eat a before dinner snack. I don’t always eat one that’s sweet, though, because I have diabetes. But on days when I exercise more, I need higher sugar snacks, because exercise sometimes causes me to have low blood sugar. I usually try to reserve the sweeter Kind Bars for when my blood sugar is lower. Diabetes is an annoying disease which requires a lot of effort to maintain the right balance. 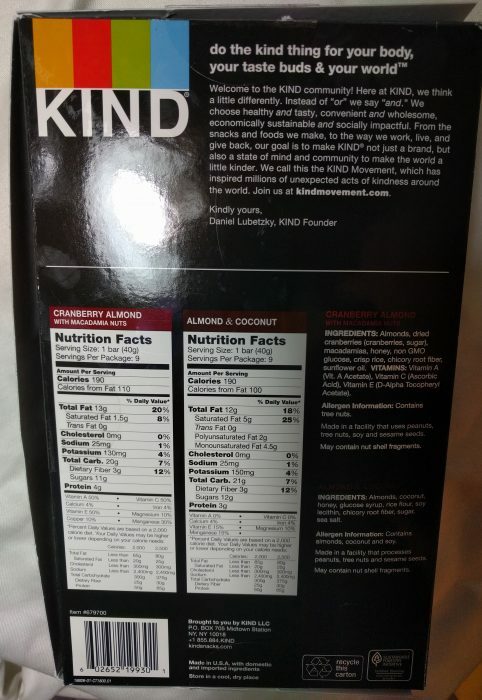 Kind bars are a healthful snack, but I always have to pay attention to the nutrition profile of anything I eat. So, let me get back to reviewing this delicious bar. It’s composed of almond pieces and whole almond, and layers upon layers of coconut. It’s very chewy and quite delicious. Its stickiness feel is just about average. (If you’ve read my other Kind bar reviews, you know that some are so sticky that they stick to paper plates.) So, it’s not super sticky. But it’s definitely chewy. 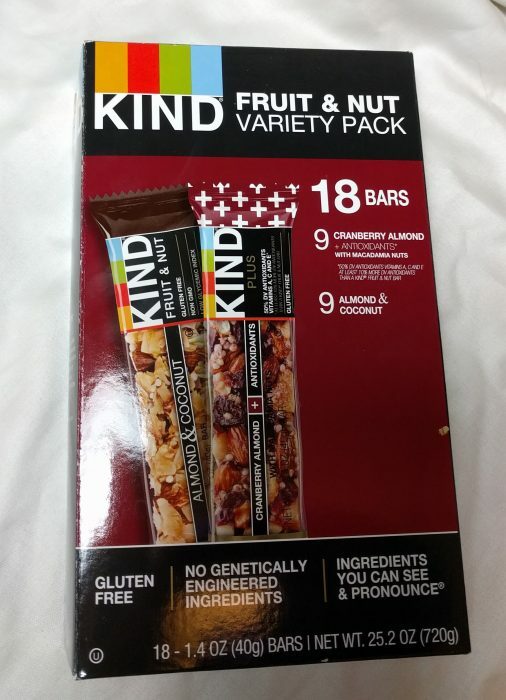 At 12 grams of sugar, this Kind bar is sweeter than their Kind Bar Nuts & Spices bars, but it’s still less than a 6oz yoplait blueberry yogurt (which has 18 grams of sugar). I recommend this flavor if you’re a fan of coconut, because you’re going to get a lot of it! Haha! Any other programmers find themselves putting extra spaces in their parenthesis when writing english? I keep having to remind myself, this isn’t code. I guess that’s what you get after writing and reading code all day.